Hello, my name is Elke J. Koscher and I am the founder and CEO of My Brand New Image, LLC. I am passionate about helping women create and establish an image that speaks for them and guide them in developing their personal image, brand and style. I grew up in a small town in Germany. My mother suffered from an anxiety disorder and was not able to leave the house by herself. So from early age on, I was my Mom’s ‘Personal Shopper’ when it came to running errands and even clothes shopping. Sometimes I accompanied her to the store, but most of the time, I went by myself. I personally loved picking out the clothes for my Mom at a local boutique. The owners knew my Mom in person and her taste and style and when I got there I helped pre-select the outfits and then brought them home for my Mom to try on. Then she asked my Dad, sister and me for our input and she always relied on my feedback because she knew I was honest with her and she could depend on my intuitive sense for style, shape and color, even though I was the youngest. My Mom nurtured my creative abilities from early age on and I helped my Mom feel beautiful and appreciated. Knowing she received compliments when she went out with my Dad and boosting her self-confidence, was very satisfying for me. Needless to say that since pre-school I picked out my own outfits and then later dressed my entire family. In elementary school, high school and college I was known for a ‘fashion icon’ and my friends always asked me for style advice. To continue the theme of image, style and branding, I worked in retail, where I interacted as a consultant with many industry experts (buyers, personal shoppers, photographers, etc. ), and also enjoyed modeling, where I worked closely with designers in Europe, which exposed me to a world completely immersed in fashion, fit and tailoring. It was just a natural development for me to get into the Personal Branding and Styling business, since I’ve been doing it more or less all my life. To me it’s not work and I get joy from seeing transformation happening right in front of my eyes. In addition, my Master’s degree in Marketing, along with my fashion and business expertise, enables me to make informed decisions and to cater to each client’s individual needs. 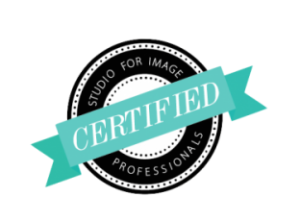 To offer my clients the best and latest service I got certified as a Personal Branding Consultant through The Studio for Image Professionals and I keep up with continuing education in image specialties through the Fashion Institute of Technology (FIT) in New York. As a visionary, I have the talent and intuition to see each person as they are at their core and translate those values into a whole new look that leaves them with confidence and feeling empowered, looking stylish while being connected to themself from the inside out. My mission is to help maximize looking one’s best by living their Personal Brand. What you do is so important. A lot of women don’t realize the impact of the image they present. Your intuition is your gift!